У Сьветлы Панядзелак 25 красавіка 2011 г. пайшоў з жыцьця Мітрафорны Пратаярэй а. Міхаіл Страпко, былы настаяцель (з 1982 да 1999 г.г.) Беларускае Аўтакефальнае Праваслаўнае царквы Сьвятое Жыровіцкае Іконы Божае Маці ў г. Кліўляндзе, штат Агаё, ЗША. Абрад паховінаў адбудзецца ў пятніцу 29 красавіка ў украінскай царкве Сьв. Уладзіміра ў г. Парма, прыгарадзе Кліўлянда (St. Vladimir Cathedral, 5913 State Rd., Parma, OH 44134). Кансысторыя Беларускае Аўтакефальнае Праваслаўнае Царквы. Not only Fr. Mike build first church in Cleveland, OH but was driving force in starting the church bingo operation which further generated proceeds and funds for other charity groups. This church run charity operation also generated funds to build a new church and community party center in Strongsville, OH. When the church council decided to sell the old church it truly devastated Fr. Mike. But he would not let this decision stop him from demanding church council to try and save the church. Even I as his son was taken by his passion and commitment to this cause of preserving this church. However, church council insisted we could not support two churches and decided to sell the old church and property. Several months later The Jones Home, a Cleveland charity purchased the church and property This still did not waiver Fr. Mike’s passion for his Orthodox faith and the rich and storied history of this church this moved him to make a hugue gamble. With no help or support from any individuals or other organizations father Mike used his own home as collateral to buy the church back from this charity so it would remain in control as an Orthodox Christian church. I was shocked to find he made the purchase a month after the final paperwork was completed. I remember being angry with him and asked why he purchased the church and he said “ I had a dream on night and in this dream God told me to buy the church back so it could remain a Orthodox church!” I was shocked at this remark and stared at him in disbelief. I raised my voice to him and said ”How can a person 80 years old make a gamble like this with his little assets?” But Fr. Mike stood by his decision and insisted it was the right decision to make. In the last months before his death we still debated his discission on why he bought this church back? I could only reason that his faith and passion to do what he thought right over road any sense of logic in making a good business decision. 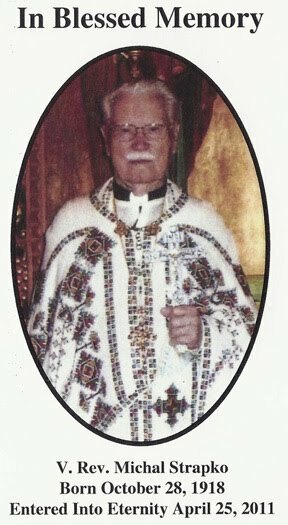 He will remain a martyr of the Orthodox faith and his belief in his Belorusian heritage. таксама браў удзел і а.Міхаіл Готарук (УПЦ у ЗША - Усяленскі Патрыярхат).